Yes: you can fall in love with food. We’re talking about a love for food so strong that you’ll find yourself saying things you didn’t expect, and maybe even walking funny afterwards. 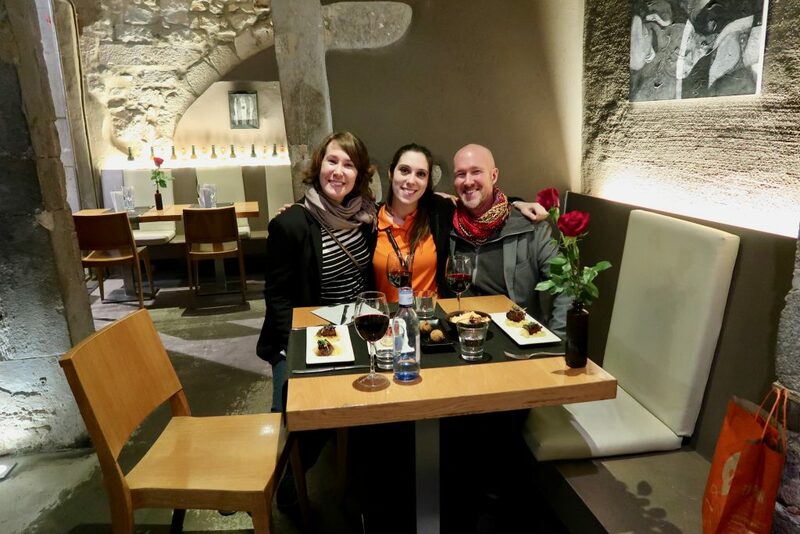 By the end of the Tapas & Wine by Night by Girona Food Tours, you may be speaking English with a little bit of Spanish and a dash of Catalan, and perhaps waddling home while thinking about joining the gym, because you ate so much great food! And you’ll probably fall in love with life in the Medieval city of Girona, too. At least this was our experience! 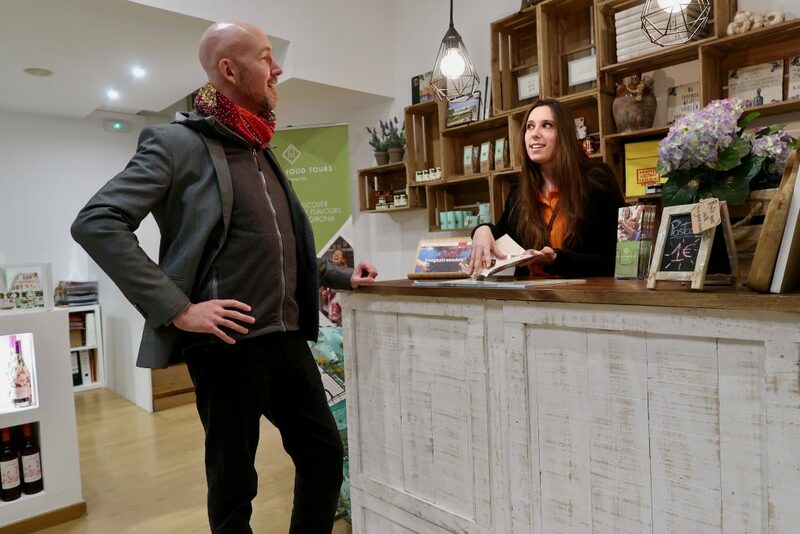 Girona Food Tours office is located near the ever-charming Old Town, and it is remarkably stylish! As the sun was setting on Girona, we met our tour guide, Pat, at the Girona Food Tours office. 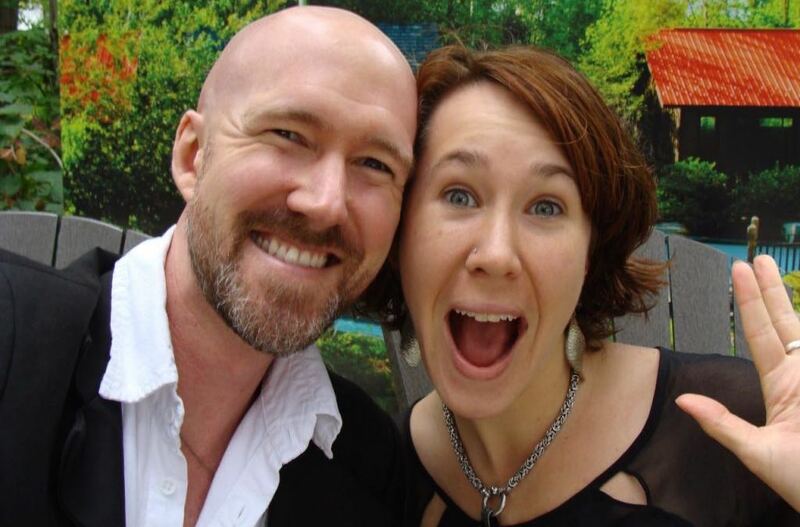 We had empty bellies, and much excitement for what was to come! 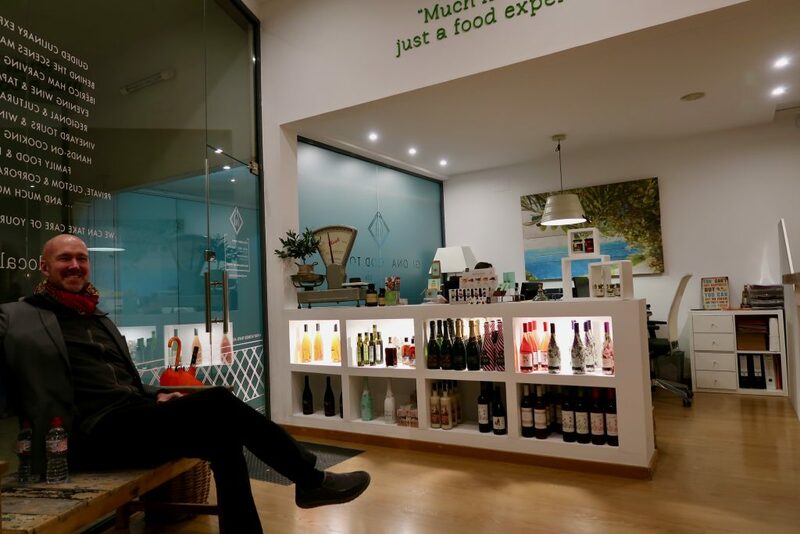 In their office, you can peruse local wines and treats while you wait for the rest of your group to arrive. When we met our tour guide, Pat, we instantly adored her radiant charm! Enjoy a dash of history and local insight. As we left the office and headed to our first stop on the food tour, Pat shared with us a bit about the history and local legends of the city. 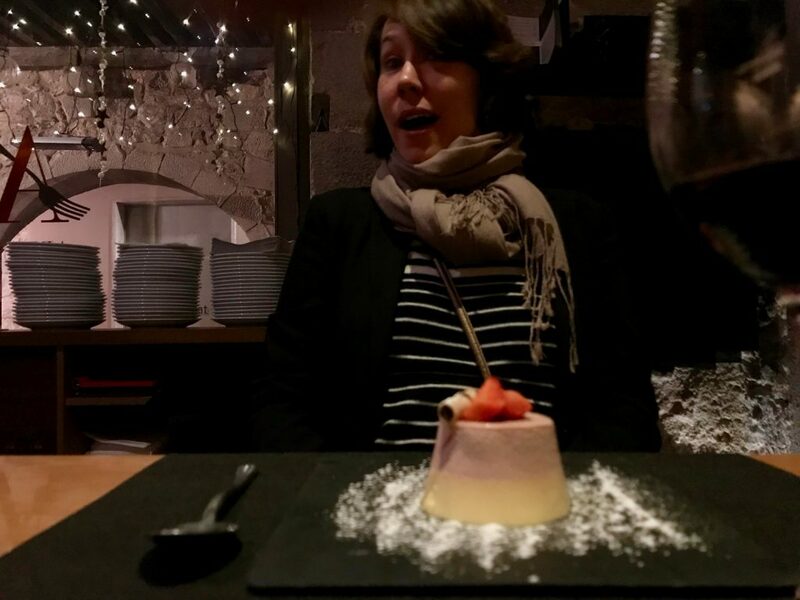 As we were on the cusp of falling head-over-heels in love with Girona, we had lots of questions about what it was like to live in (and eat in) Girona. 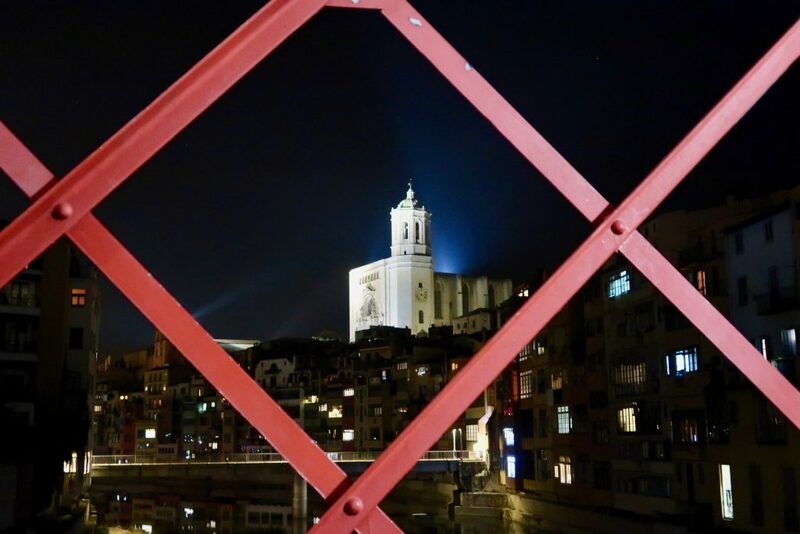 We crossed the landmark bridge designed by Gustave Eiffel as we explored the enchanting Girona night. As we crossed the Iron Bridge (one of many names given to this iconic bridge,) the well-lit cathedral loomed in the distance. As we walked, Pat mentioned a fascinating fact in one place, and pointed out an insightful discovery in another. In one spot, we recognized the logo on this sign from our visit to Dalí Theater-Museum in Figueres. This plaque signifies that it is a special kind of artisanal bakery of Girona which makes their beautiful loaves fresh every day and without preservatives. When you see this, you know you’re getting something amazing! Our first stop set the stage for the night! Our eyes lit up like light bulbs when we saw our first stop of the evening! The shop nearly glowed from the all tasty Iberico Ham and cured meats inside. Everyone — including Pat — was excited! 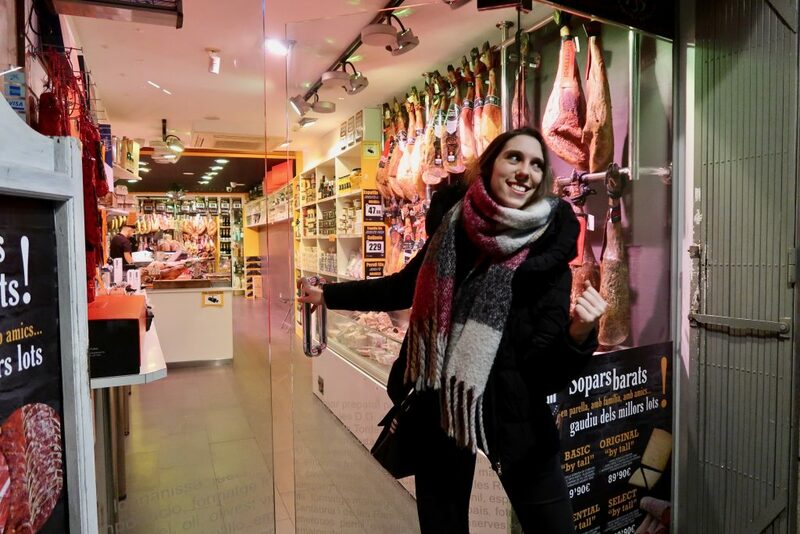 We kicked things off with a bang by checking out some of the region’s world-famous cured meats! I think it’s a slight understatement to say folks in Spain take jamon seriously. It’s a big part of their life! I know we certainly enjoyed our fair share of jamon while in Spain, as this is a very common part of tapas. 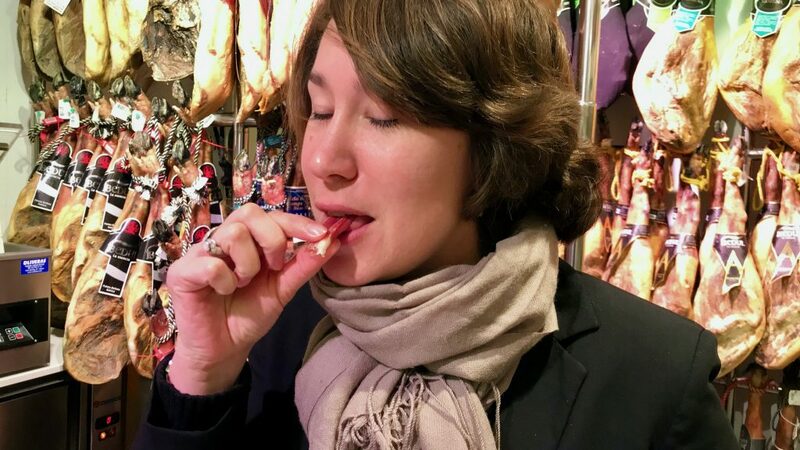 When you smell the scent of the meat on the testing stick, you can determine a lot by how strongly it smells, and with what sort of aromatic bouquet. It was a delight to learn about the ham we’ve been enjoying so much! Iberico Ham has very specific standards and qualifications, much like what you find with wine. The factors that affect the taste (and of course, price) are based on whether it’s the front leg or the back leg, how long it’s aged, if the pig was fed only an acorn diet, and what percentage of Black Iberian breed the pig was. 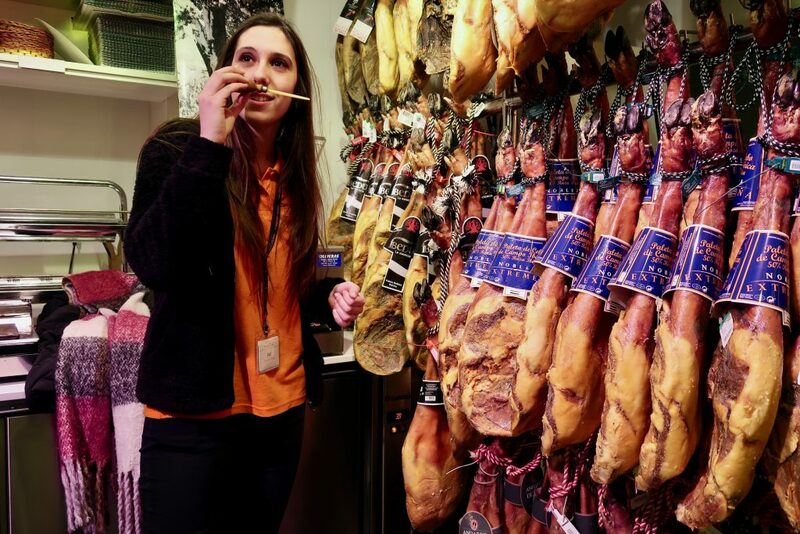 The jamon shop masters hand-picked every leg in the shop. To tell if the ham was ready to cut into, they would stick a special tool into the thickest part and the smell would tell them if it’s ready, or it the ham needs a little more time to age. Learning about Iberico Ham made us appreciate it all the more! We then tried three very different hams that each had their own unique flavor and texture. The hams paired beautifully with a crisp cava. After the tasting, we were treated to a lesson on how to cut the perfectly paper-thin piece of ham off the leg. There is a very specific technique and knife used to slice the meat so beautifully, uniformly thin. I have to say: it was a little harder than it seemed! Catalan is known for its seafood paella. Our next stop was all about comfort food like your Catalan grandmother used to make! Paella is a local rice dish that can’t be missed when you’re in Girona! 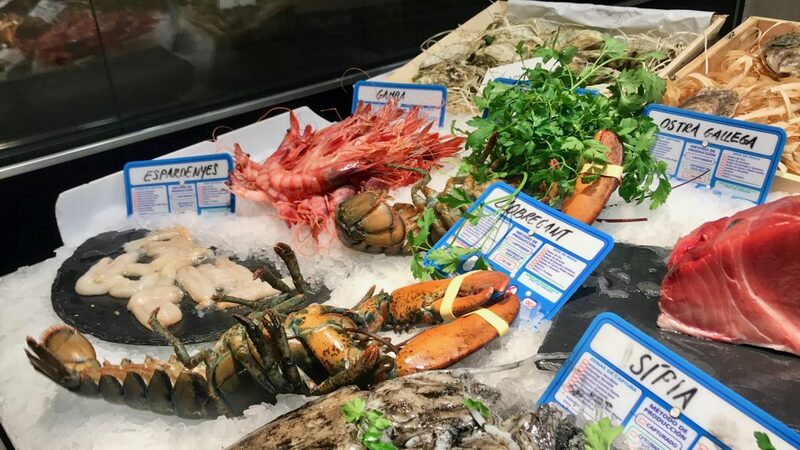 In another stop on our tour, we discovered a place with incredibly fresh seafood. Some of it was still wiggling! Our second stop boasted some of the freshest seafood: like, “still moving” fresh. It was an amazing array to choose from! The paella that we enjoyed was AMAZING! Paella is made in a wide, flat pan, and due to how it’s baked it has slightly crispy and caramelized edges… which are my absolute favorite! With three different types of tasty seafood paella to enjoy, paired with a refreshing white wine, we were really feeling the “comfort food” vibe. Surprise! We were delivered some gooey, delicious chocolate truffles as well! Before leaving, we were surprised with a little sweetness. Oh my! 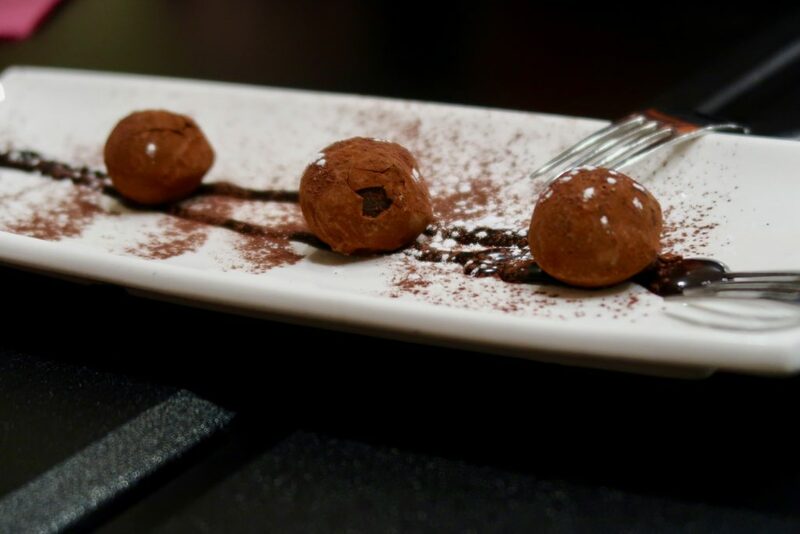 These delicate chocolate truffles were to die for — they had a hard coating that crunched when you bit into them, and a rich gooey chocolate inside. Yum! Expect fun along the way. I don’t know if it was all the good food, or the magic of the Medieval city streets, but we had a hoot walking to our next stop! It was a playful time, strolling around the beautiful cobblestone neighborhood… and we enjoyed things from various new perspectives! Do we have any Game of Thrones fans?!?! 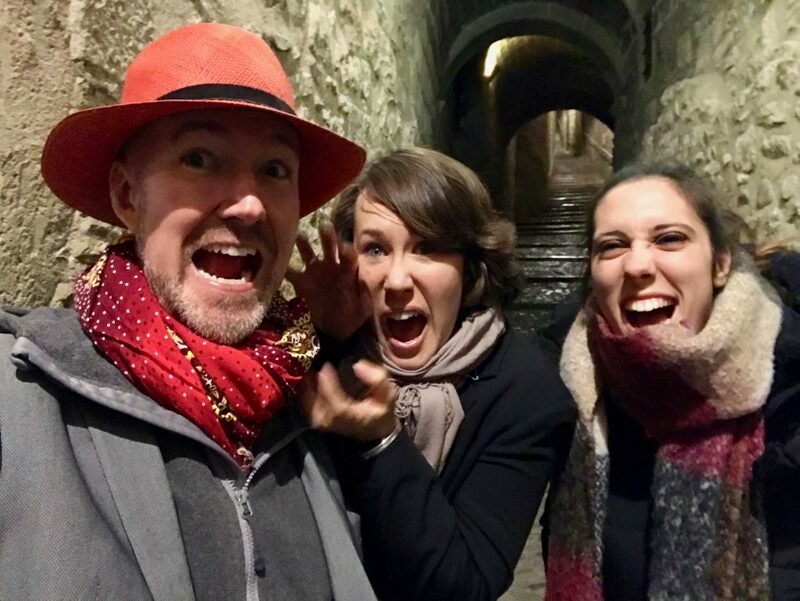 In honor of Game of Thrones — some of which was filmed in Girona — we bust out our terrifying dragon impressions. It might be a little hard to tell — due to our “ferocious” faces in the way — but a scene from Game of Thrones was filmed in this alley! They also used the beautiful cathedral in the show as well, although Pat was saying that the way it appears in the show makes it seem like a whole other world. Warming up with a local long pour! There is a special technique to pouring the drinks that we enjoyed with our pinxos, at our next stop. Do not try this at home, folks! Or if you do: try it over the sink. 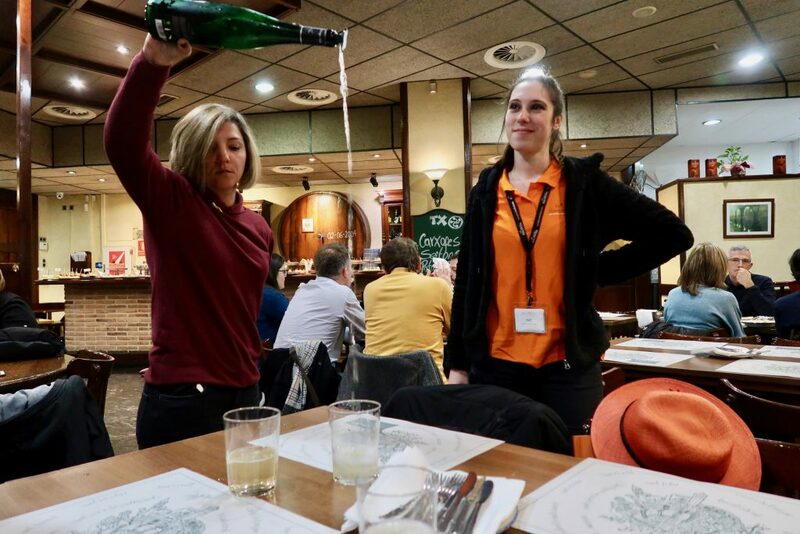 We realize this is an everyday routine to the waitress serving us wine, but we were considerably impressed with her long pour! She was serving us a lovely local white wine that warmed us up nicely after coming in from the cool night air. It also paired beautifully with the pinxos that we were about to enjoy! Cheers, to old and new friends in Girona! The beauty of pinxos is that you can pinch a little nibble from here and there, according to your whims. 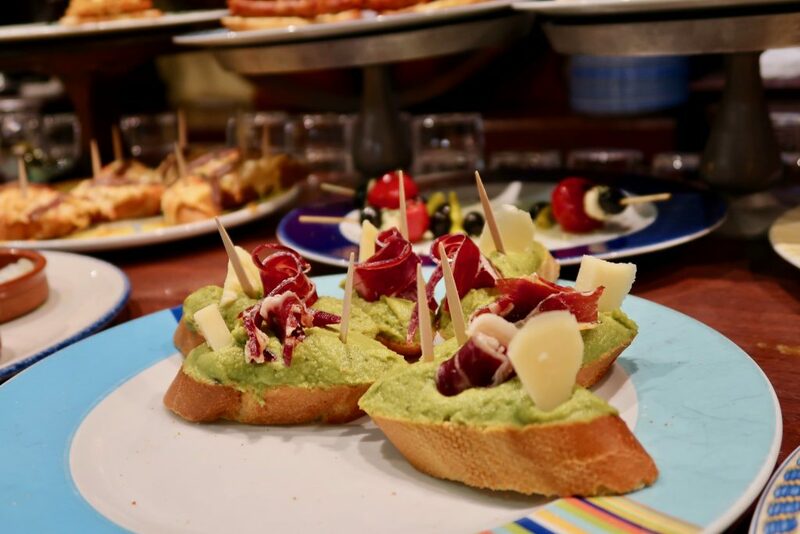 Pinxos (or pinchos) are very common in Catalonia. This taverna is well-known for their wide selection of beautiful offerings! There are all kinds of pinxos to choose from! Is your mouth watering, yet? All the beautiful pinxos were lined up at the bar, for you to help yourself. 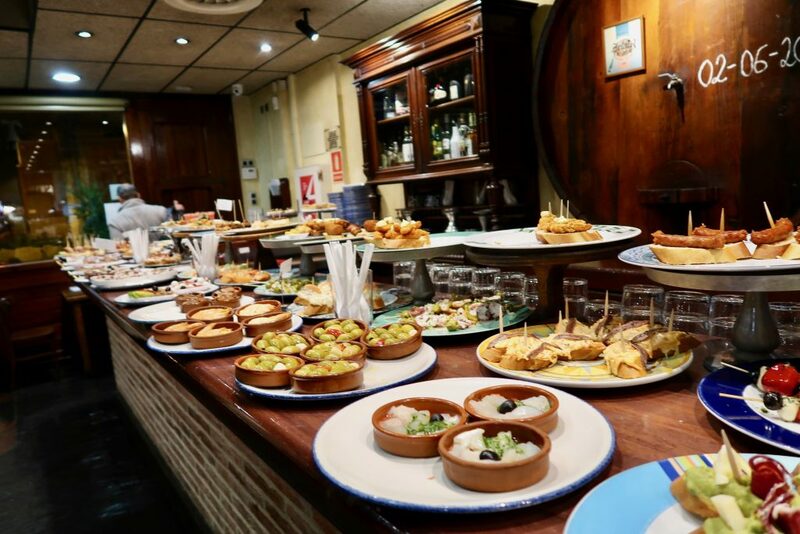 They differ slightly from tapas, in which tapas are small plates that are easy to share with friends such as olives, cured meats, and cheese… or fried eggplant with honey (another of my favorites!) On the other hand, pinxos are not so much for sharing, since they are usually bite-sized. Ending the evening with full bellies, and a little romance! 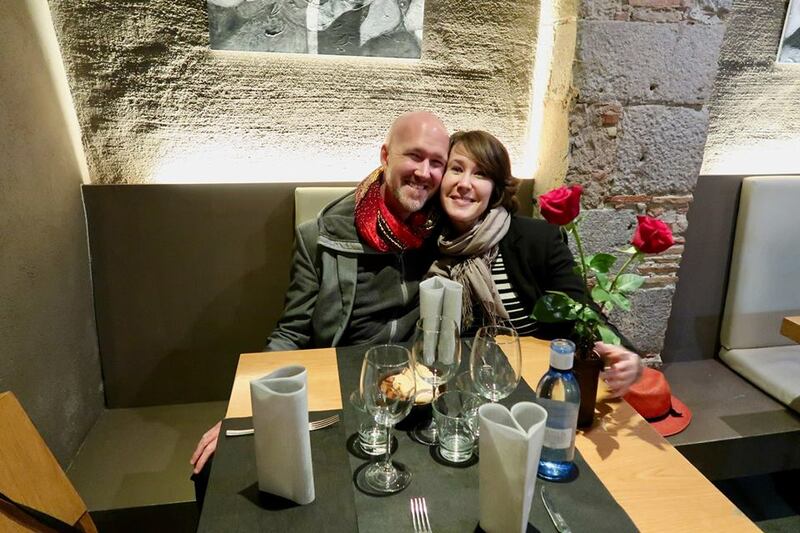 We ended our evening at a truly romantic restaurant in the heart of historic Girona. The building used be to an old stone farmhouse, and has kept much of its charm. Romance is alive! Our Valentine-week spirit was stirred by the ambiance in our next stop. 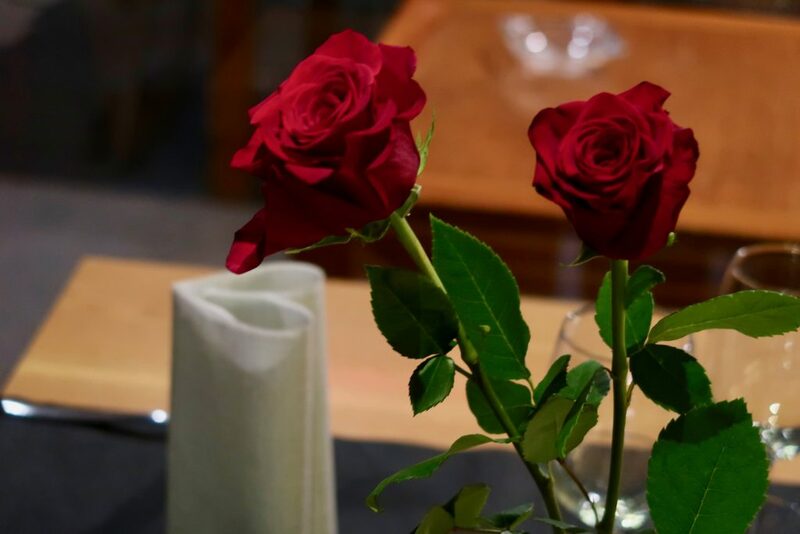 At our table, we were greeted with red roses, and napkin hearts! We were in love. Bravas — or patatas bravas — are a mainstay on most tapas menus, yet the fried potatoes are graced with a different style of spicy sauce from one place to the next. Don’t forget to share! Patatas bravas are a kind of tapas that you will find on nearly every tapas menu — and they are in a whole other class beyond the common french fry! The fried small potatoes have a crispy and golden exterior, and they are soft and warm inside. The sauce really sets them apart — I guess you can call it the “magic sauce?” The house sauce at this restaurant was creamy, with a bit of spice to wake up your pallet. This beautiful veal dish was one of Curtiss’s favorites — he still talks about it! The area is known for its tender veal, and this dish was a showcase of that local treat! 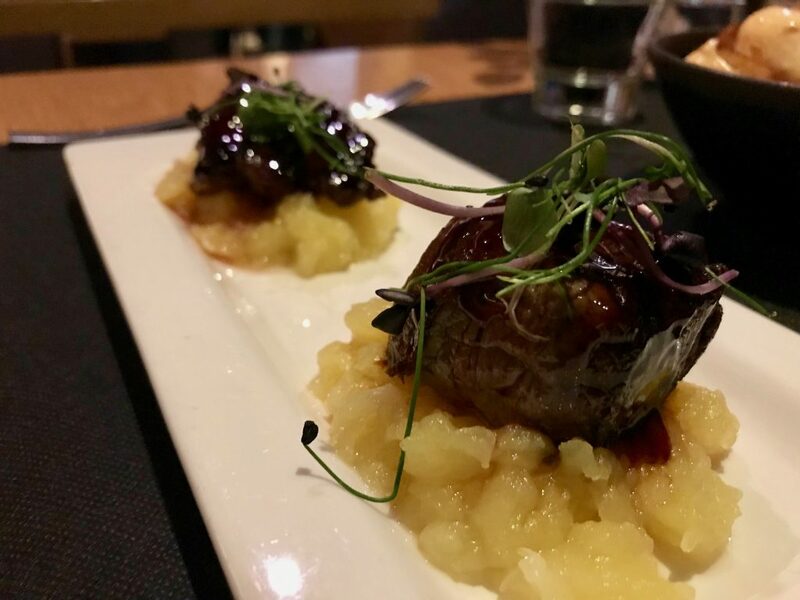 The seared veal medallion was paired with a compote made of tangy local apples. We enjoyed these dishes with a glass of robust red wine, and we were blown away! We had such an unforgettable evening. Pat was our beloved superstar! 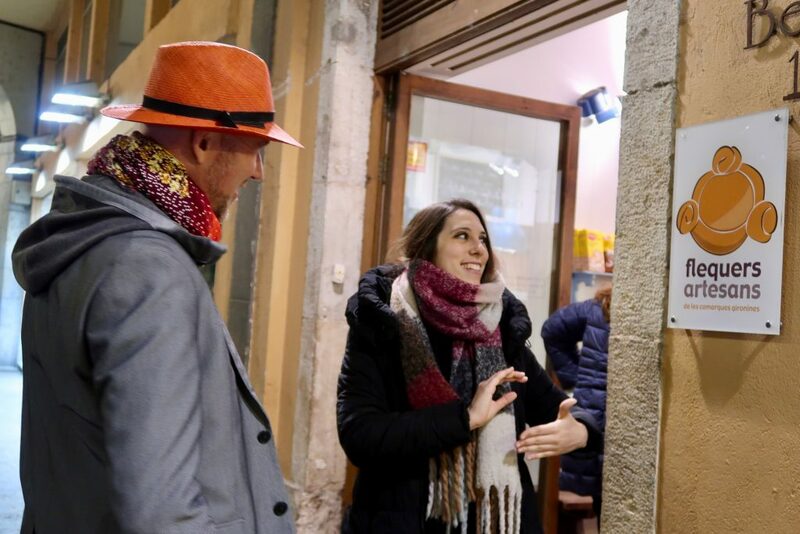 Thank you Girona Food Tours for an incredible evening in Girona! 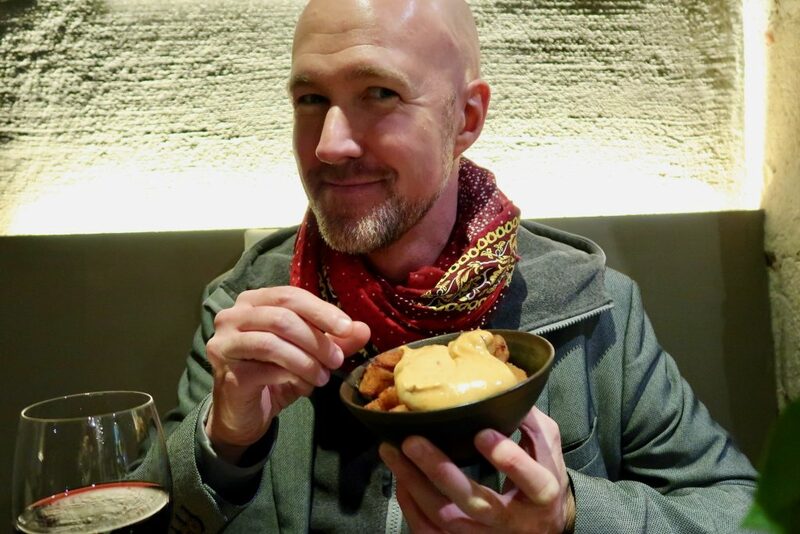 We were surprised and enamored with our whole experience, and we can’t wait to get back to the area to revisit Girona Food Tours.